…he probably wouldn’t have done anything with it. I used a 1/4 inch plywood board, primed it, then painted it with Kylon’s Metallic paint in Nickel. I used my Cricut and contact paper to cut out the first few lines of the poem. I used the Celebrate font on the Calligraphy cartridge. Once all of the letters were adhered to the board, I sprayed a white gloss paint over the top of everything. 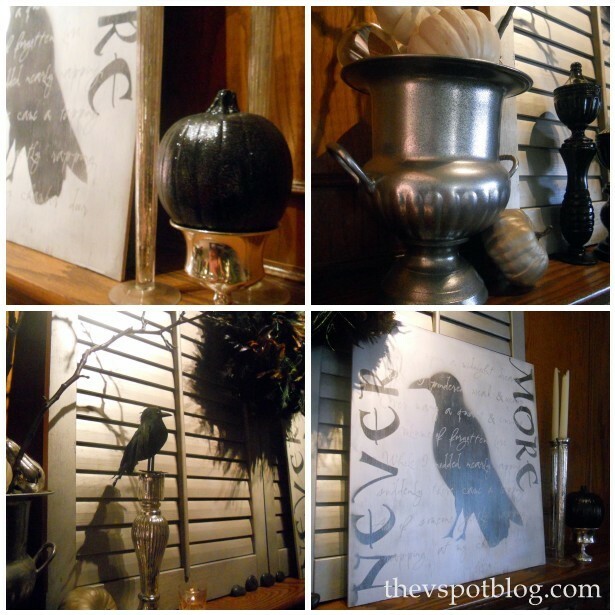 When dry, I created a stencil that said “Nevermore” (this was the came cartridge, but using the Inspiration font.) 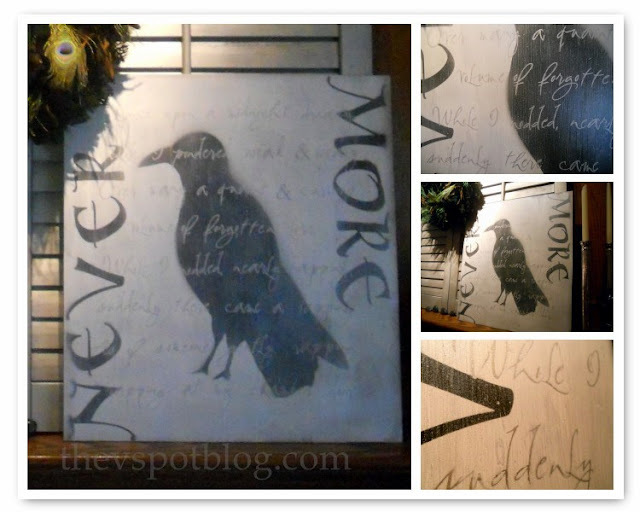 I did not remove the lettering for the poem, but adhered the “Nevermore” stencil directly over the top of them. Next, I free-hand sketched a reasonable facsimile (I’m no artist, don’t you judge me…) of a raven on contact paper and cut that out to create a stencil. I placed that over the top of the poem’s lettering as well. I taped off the rest of the board and sprayed the stencils with black paint. Whatever you want to show up as the “top layer” of your painting needs to go onto the board first. The stencils will appear as being under the poem. 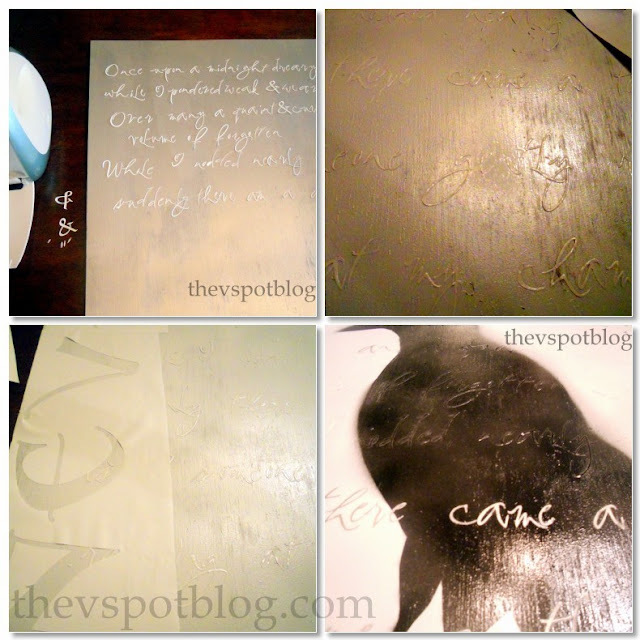 When dry, I peeled off the lettering and stencils and lightly sanded the whole thing. A light wash of silver acrylic paint and water finished it up. Now I think my Halloween mantel is all done. Check the bottom of the blog to see where I link this project. I like it a lot! It feels very classic. I might display it all times of the yr.
Ooooh, I LIKE I LIKE!!! A great project and not just for Halloween. If you could see the size of the crows/ravens at our cabin you would be even more scared. Yikes. They are monsters. Great job! I love the ominous creepy feel. I did a similar project–check it out! Yay for the cricket! Lovely project! perfectly eerie! ay yi yi, I just love it! I love what you did but how you did it went right over my head. I’m sure you’re shocked. I still don’t get how you put the bird OVER the words but I can still see the words? Don’t bother explaining. I’ll re-read this again for the 5th time to try and understand a creative genius’ mind. This is a fantastic project that I am totally stealin. Love it Viv! And without knowing it you answered a question I’ve had which was about cutting contact paper with the Cricut! Love your piece! Looks great! I LOVE this! Great job! I’d love to have one! 1 down, 14 to go, I am so proud of you! I love this one, I know I say that every time but I really, really do! I think I’d display it year round it is beautiful! What a pretty, I mean eerie piece of art. It turned out great..watch out or Rook No 17 will drive down and steal it! The entire mantle looks great! Said the reader….You should have made more!! Vivienne, I absolutely love this! I have never seen you do anything like it. Pin, stumble! How neat! So unique and spooky (in a good way!)! xoxo! I love this piece, I’m not big on Halloween decorating but this one has caught my eye. I need to come sit next to you regarding using my Cricut, I’m so uninformed on its “powers”. Thanks for sharing. This is so cute! It turned out really well and looks great in your house! I am hosting a really fun giveaway at my blog. Would LOVE for you to come and check it out! Beautifully done, Viv! Poe is one of my favorite author/poets and you did him proud for sure! I am from Baltimore… home of the RAVENS (thanks to Poe) and I got married in the church where he was buried (in our city)… pretty cool, huh?! This is a fantastic project! I’d love for you to link up to my Wickedly Creative Halloween Ideas Party. this is awesome … thanks for sharing! Love it, very nice job, how creative. Thanks for sharing. Love this…and I agree it is amazing what you can do with a cricut and contact paper. I have been doing a ton of stenciling. Come check it out some time if you get a chance! Very nice, Poe Perfect! New follower well I signed on and it disappeared, I’ll check back? Found you at Sisters of the Wild West! Hope to have you stop by! Love it! I really really need a cutting machine. Santa?! Your mantle looks super ready for Halloween. Love everything you did. Awesome Halloween post! Great idea. Thanks for sharing. LOVE this Viv!! So smart! What clever decorations! I love the Raven theme! Your so creative! It looks wonderful and Poe like. Very clever project. Enjoyed it and your humor. What a neat idea…wow! We live in MD and are huge Ravens fans, plus I used to be an English teacher, so I appreciate this in all its coolness! Would you share it here? That looks really clever. I’ve thought about getting a cricut they look like so much FUN. Well I did it! You inspired me to cut the Contact paper and I did. Just posted my project. It’s nice to see something that’s dark, but also stylish (and not so much orange) Beautifully done, V.
My Halloween wreath….all it’s missing is a whip. My mantel and I have agreed to a cease-fire. Pottery Barn inspired Bone Hand Skeleton Vase.